What would you like to Build? BGD Anita Custom Halo vs. French Set Halo Knife Edge vs. Half Round Solitaire Does $2000 Buy a Good Engagement Ring? 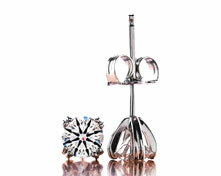 Types of 3 Prong Martini Settings for Studs Platinum Setting What is the lowest color Brian Gavin recommends? Black by Brian Gavin vs Brian Gavin Signature Differences in Asset Images for High Performance Diamonds 2 carat diamond solitaire engagement rings for 30K Brian Gavin Blue vs. Brian Gavin Signature Are your VS2 & SI1 diamonds always eye clean? You must be logged in for this. 3, 6 or 12 month Financing. Easy and Flexible Monthly Payments. The three stone engagement ring setting is also a classic design, appropriate for a diamond engagement ring, diamond wedding ring, an anniversary right hand ring, or as a visually powerful expression of love for any occasion or milestone event. Sometimes called a trilogy or trinity setting, a 3 stone diamond ring symbolically represents synthesis, harmony and unity, as well as the marriage of mind, body and spirit and past, present and future. This ever-popular setting is an accurate reflection of a couple’s relationship over time and the different stages of their journey together through life. The larger middle stone signifies the present, where their past together has led them, while the matched side stones represent how the past and future support and sustain their commitment for a life-long partnership together. A wide variety of customization options. The three stone setting offers you a broad variety of options for personalization and customization as an engagement ring, wedding ring or anniversary ring. Your choice of stones. The traditional and most popular stone choice is three diamonds of the same shape, often with the middle stone being larger. However there are no hard and fast rules, and you have the freedom to be creative and select both the middle stone and side stones in varying shapes – like tapered baguettes and pear shapes, different sizes, and even the option to choose different gems as side stones to match and complement the main diamond. Your choice of shapes. To emphasize the symbolic significance of this setting, most three stone diamond engagement rings and three stone diamond wedding rings use a prong mount with the center stone being slightly raised or prominent. A common variation is the use of a brilliant round diamond center stone, like our Signature Hearts and Arrows diamond combined with diamond side stones in a fancy shape such as oval, pear or marquise diamonds that “point” to the central and dominant stone. 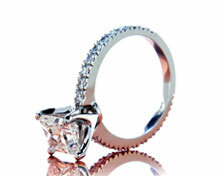 But your choice of diamond shapes and combinations are limited only by your imagination, taste and budget. Your choice of metal. Like any diamond engagement, wedding or anniversary ring, the three stone setting offers the flexibility of using white gold or platinum to emphasize the whiteness in a precisely cut diamond, though some couples prefer yellow gold to complement well-cut diamonds or other gemstones or to pair with gold wedding bands. The three ring setting offers both flexibility and tradition. We invite you to browse our online catalog for ideas, or contact us and we’ll help you narrow your choices to create the perfect ring for your loved one. Enter your email for news and updates, plus special offers that you'll only get in your inbox! Website Designed and Developed by Softway Solutions, Inc. and Optidge, Inc.
©2009 - 2019 Alpha Creations, Inc. All rights reserved. Copyrights and Trademarks.